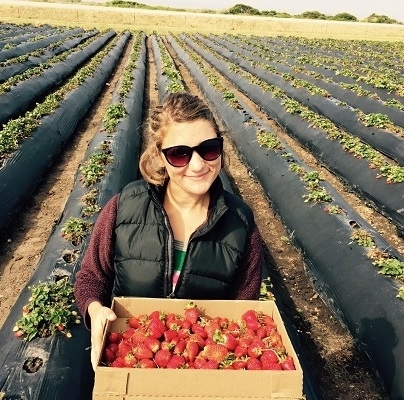 California agritourism operators report regularly that navigating the permitting and regulatory process is a major challenge for farmers trying to invite the public onto their land for festivals, tours, dinners, classes, lodging or other activities. Some help is now available, at no cost, in some places. Five Northern California counties offer non-enforcement person-to-person consultation to farmers and ranchers exploring the regulations and permitting requirements for agritourism, food processing or other farm-related activities. If your farm or ranch is located in Marin, Sonoma, San Mateo, Yolo or Solano Counties, you can call your Agricultural Ombudsman or Farmbudsman to discuss your ideas and plans. County Agricultural Ombudsmen help farmers and ranchers understand what rules and regulations will apply to an individual diversification idea or plan, and will help them to navigate the various permits and departmental approvals that might be required. 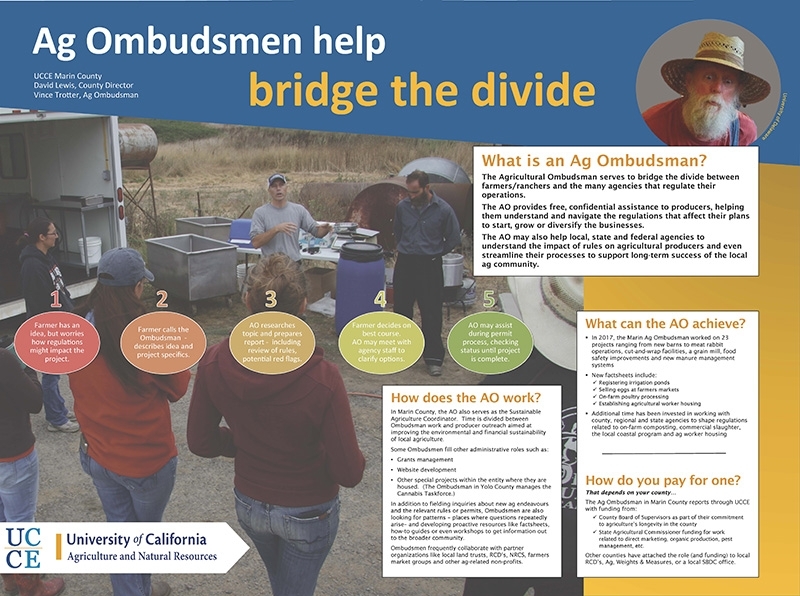 The ombudsman will make the process approachable and accessible, and will explore options and alternatives with the person planning an expansion or a new activity on his or her farm or ranch, including giving the farmer or rancher a sense of where "red flags" might be in the process. Importantly, these services are confidential. Marin County Agricultural Ombudsman Vince Trotter explained the job this way, "We try to bring the conversation to "How can we make this work?" We don't expedite the process ourselves, but we do try to bring the rancher together with the regulator." Helping a rancher understand the state registration process required for a new pond. Helping a poultry farmer understand the state, federal and local regulations they needed to confirm to for on-farm commercial slaughtering. Helping a pumpkin patch operator know when a permit is required for a farm dinner. Explaining the size limits for starting a small winery under an administrative permit. Researching an existing use permit to clarify that a vineyard operator with short-term lodging was allowed to hold one-day open house events without an additional health department food permit. In addition to their consultation work with individual farmers and ranchers, most of the agricultural ombudsmen organize useful information online - guides, factsheets and links to common permit applications. See the end of this story for contact information and websites links. Marin County was first, creating the position of Agricultural Ombudsman in 2002 to ease the regulatory barriers faced by farmers and ranchers trying to diversify to ensure longterm viability of their agricultural operations. The county funded the position through a cost-share between county general funds and the Ag Commissioner's office. The Marin County Ag Ombudsman is not a county employee, but an employee of the UC Cooperative Extension. This distinction is important as the Ombudsman is perceived as a neutral, non-enforcement person with whom farmers and ranchers can freely discuss their ideas and plans. Lisa Bush held the position for twelve years until her retirement. The current Marin County Agricultural Ombudsman is Vince Trotter, who also wears the hat of UCCE Sustainable Agriculture Coordinator. Following Marin County's lead, Solano and Yolo Counties both included the position of an agricultural ombudsman in their General Plans adopted by Solano County in 2008 and Yolo County in 2009. After years of discussions with interested stakeholders from the agriculture communities, the Boards of Supervisors in Solano and Yolo Counties and the Solano Community College Board of Trustees adopted in January 2013 a joint operating agreement to fund and manage a Farmsbudsman program that served Solano and Yolo Counties. Michelle Stephens served as Farmbudsman for both counties for three years. In 2016, Yolo County withdrew from the joint agreement. Currently Yolo County funds their own Agricultural Ombudsman position housed within the Agricultural Commissioner's office, working closely with the County Planning Department. Solano County continues the Farmbudsman program with Humboldt State University's Nothern California Small Business Development Center (Norcal SBDC) administering the program. Currently, the Yolo County Farmbudsman is Stephanie Cormier, also Cannibus Taskforce Manager; the Solano County Farmbudsman is Sarah Hawkins, who is also a full-time farmer. The Sonoma County Agricultural Ombudsman position grew out of a Food Forum held in 2011 to improve the regulatory process for farmers. In July 2013 Sonoma County approved the position, which is administered through the Sonoma County UC Cooperative Extension and paid with county funds. The Sonoma County Agricultural Ombudsman is Karen Giovannini, who says that the ombudsman position comprises about 20 percent of her full-time work with UC Cooperative Extension. San Mateo County's Agricultural Ombudsman position developed from a 2012 agricultural workshop organized by a county supervisor to help agricultural producers deal with regulations. The county put out a request for proposals to local organizations to administer the position, and the San Mateo County Resource Conservation District placed the winning bid to host the ombudsman. 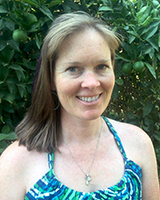 Adria Arko started as the San Mateo County Agricultural Ombudsman in April 2015. She works out of the San Mateo County Resource Conservation Service office, where she also works as a Program Assistant.